If you are an often traveler, enjoy spending time with friends outdoors and feel that you need some music playing on the background, however radios on batteries are becoming troublesome because of the constant need of battery replacement; then you have to have one of these great solar powered radios! Such a radio will not require any more of your time and additional expenditures for battery replacements. Solar powered radio will charge itself directly from the sun, therefore there are no more worries about where you should plug it in or how many back-up batteries to take. Since this radio will take sunlight and convert it into the energy on which it will run, these radios have lots of advantages. They are perfect for outdoor fun and can be taken for hiking, bike tour, family or friends camping or a while you are sunbathing at the beach. The radio can be charged by the sun while you are enjoying your time with precious people, play, swimming; and many of those radios are especially designed to withstand the consequences of outdoor use. Beyond just adding to your fun, these solar powered radios are quite practical, too. They don't need any batteries or sources of electricity to keep them working, therefore they appear to be perfect for your home emergency kit. During any troubling situations, natural disaster or energy blackout when it is not possible to charge your emergency radio in a common way, you can set the solar powered radio in a sunny window and be sure that it will not let you down. Since this device is becoming more and more popular, they come with a variety of additional options and specifications that can make choosing the most appropriate solar radio for your needs confusing. Therefore you have to follow this logic. Solar radio should have majority of features, additional to its original purpose, such as charging other devices, providing light during dark times of the day, have an energy storing battery, which will keep the radio working at night. Secondly, your solar radio has to be durable, otherwise there's no sense in buying a solar radio for your outdoor activities if it isn't prepared for heavy usage. It should also be easy and friendly in operating, particularly you have to be able to quickly access the weather broadcasting and any emergency alerts for your own safety. The Eton Corporation is a solar producer, who can offer the top rated solar powered radio model “Scorpion”. 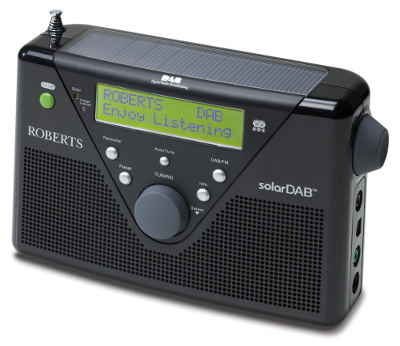 This solar radio is compact in size, and therefore it can be carried anywhere, but even though it is incredibly small, the manufacturers managed to pack lots of features into the Scorpion, particularly it receives AM 520-1710 KHz, FM 87.5-108 MHz and seven NOAA radio stations; it has a special hookup for MP3 devices so you can also play music directly from your iPod; it has a LED flashlight installed, and it can also function as an additional phone charger and many other. The other solar radio offered by manufacturers is Red Cross Solarlink FR600, which is also equipped with tons of features especially designed to keep you save in emergency situations.